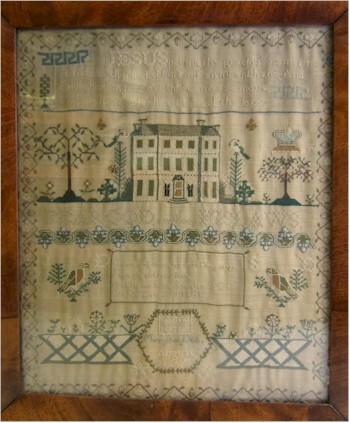 An 1815 Needlework Sampler produced at the time of the Battle of Waterloo. Coming up in our two day Spring 2016 Fine Art Auction (which is being held on the 19th/20th April 2016) are four 19th century needlework samplers, nothing unusual about that but it is interesting to compare these four samplers, which were all produced within twenty five years of each other. 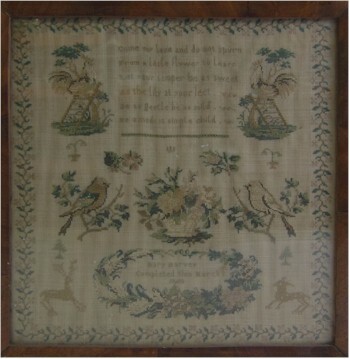 The earliest sampler dates from the year Wellington defeated Napoleon at Waterloo in 1815 and displays many of the traditional characteristics you would expect to find. The banded designs of letters and numbers that hark back to a time when samplers were also used as educational tools. There are figures, trees, monarch's crowns and flowers which keep pretty much to the traditional designs. However, the enclosing of the central verse around a border of trailing foliage and flowers is unusual, as this border is much freer flowing in its stitchwork than that of the more geometric strawberry border that surrounds the entire sampler. The next sampler was produced sixteen years later and there appears to be a greater emphasis on religious instruction than before. Gone is the alphabet, gone are the numerals and Arabic numbers; in comes religious verse, three times in this particular sampler. The sampler is still roughly divided into bands with the more decorative panels of birds, house, monarch's crown, flowers and shrubs bisecting the religious texts. This can be partly explained by the rising child mortality rate and the resulting resurgence of religion in family lives. The sampler still retains the meandering strawberry border. The remarkable stitchwork in the 1839 needlework sampler of eight-year old Clarissa Dearden shows yet a further transition in 19th Century sampler styles. 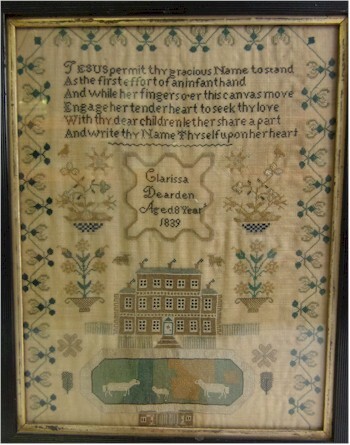 Eight years on in 1839, Clarissa Dearden produced the third sampler, which again is another transitional piece. This was produced when she was just eight years old and the stitchwork is quite remarkable for its neatness and quality of stitches. The banding has all but disappeared and we are left with a bold religious verse in black silk at the top of the sampler. Whilst the verse is not a straight bible quotation, it does show signs of a morbid sentimentality that would come to dominate the period. The house still remains with grazing sheep in the park and a gatehouse, together with some flowering shrubs and animals and again enclosed in a flowering meandering border. 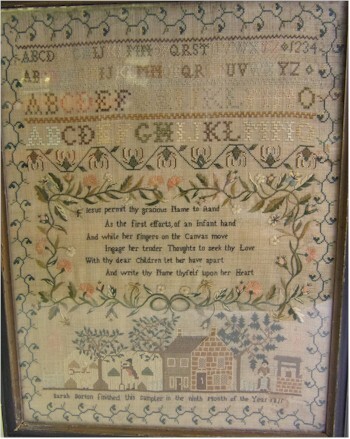 The sampler produced by Mary Harvey in 1839 shows further evolution in needlework samplers of 19th Century. The final sampler produced one year later by Mary Harvey, who may have had a much more liberal upbringing. No religious verse this time, just an over sentimental six line verse on how to be a good child. The decoration is much more patchwork like with highly detailed cockerels, birds and flowering shrubs and harken back to when 'samples' were made by seamstresses of motifs and images they wanted to remember and use at a later date. The use of numerous different colours to each of these designs suggests that Mary may well have seen a pattern book or a Berlin woolwork pattern book that were being circulated at this period. It is probably with the introduction of printed pattern books that the need for samplers declined and although samplers were continued to be produced up until the end of the 19th century, their childlike naivety became lost in a more religious and industrial dominated world. All four samplers carry pre-sale estimates of between £150 and £250.